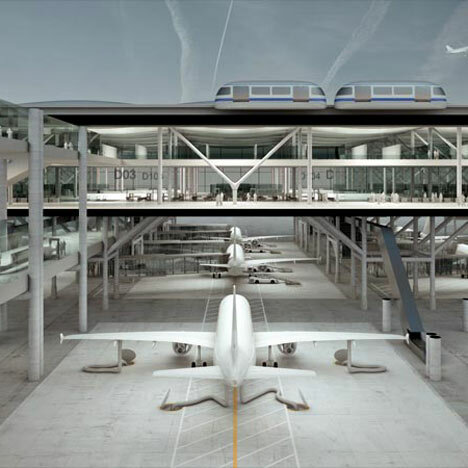 Creative studio Büro für MEHR has designed a concept for a drive-through airport that processes planes like a car wash.
Aircraft handling would be spilt into three phases: arrival, servicing and departure, arranged in a linear format. 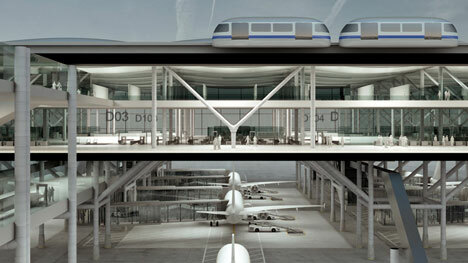 Planes would arrive under an elevated terminal and unload passengers before moving forward to the next station for servicing, freeing up the arrival bay for the next aircraft. After refueling and cleaning the plane would move on again to the departure gate for passengers to board before vacating for take off. 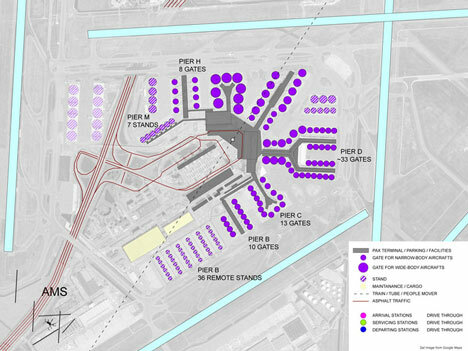 The three-station system would allow three planes to be processed in each lane at any given time and therefore reduce the number of required gates by two-thirds. 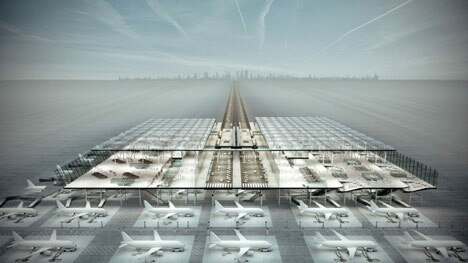 This more compact airport would shorten distances from the runway to the terminal and reduce fuel consumption. Passengers would embark directly from the departure lounge instead of having to walk long distances to their designated gates. Amsterdam / Vienna – Optimizing passenger terminal buildings is long overdue and requires a new concept. A drastic reduction in the size of airports would not only simplify ground handlings, but would also significantly reduce its environmental impact. Within the next decade the amount of aviation passengers could double. It has been widely admitted that today's airports cannot cope with demand. Future expansion will create additional terminals causing bigger distances to travel, more congestion, pollution and increasingly slower handling times. How does Drive Through Airport work? All arriving aircrafts are being sent through a path. Similar to a carwash, the main handling phases are separated into three designated stations: Arrival, Servicing, and Departure. Each station manages only one activity instead of being blocked for all three. The amount of necessary gates can be reduced by two- thirds, making the airport experience for both passengers and crews more user-friendly. Processing aircrafts are covered by an elevated terminal. While the airplanes are moving through, passenger processing takes place on a level directly above. Traffic to and from the airport is situated above the servicing stations dividing the terminal into two buildings: Departure Mall above the departure stations, and Luggage Claim Hall above the arriving stations. For transfer passengers and crew there is an underpass connection. 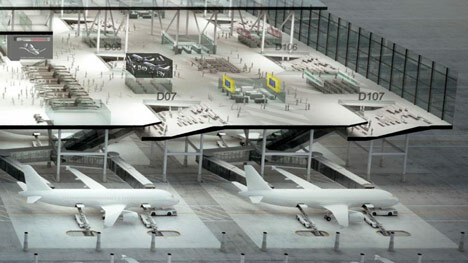 Contemporary airport layouts are determined by vast parking spaces, where aircrafts are laid out endlessly side by side. The time we spend at airports prior to flights is mostly characterized by long walks, queuing and waiting. Especially for short haul flights, time spent at airports often exceeds the actual flight time. The prototype DRIVE THROUGH AIRPORT was developed mainly for a dense network of continental or short haul flights of narrow-body aircrafts carrying up to 200 passengers each. (ICAO Type B,C, C+ / Boeing 737s, Airbus 320s family, Embraer E170-E190s or lighter). Based on an average turnaround time of 45 minutes leaving 15 minutes for each activity (arrival, service and departure) and on current regulations for maximum runway capacity of one landing aircraft per minute; 16 stations were laid out for each handling activity. (After 14 minutes each arrival station is freed for the following aircrafts.) One lane consists of six stations (two for each activity). An 8-lane prototype Drive Through Airport can handle up to 48 aircrafts at every 15 minutes, which is equivalent to a 144-gate airport with a "traditional" 45 minute stand block time. Today, Airlines work hard to reduce grounding times and make their time tables more efficient. ("Only a flying plane is a good plane") Low Cost Carriers already have 25-30 minute turnaround times outside their home bases. A shorter total turnaround time would make Drive Through Airport even more efficient and could reduce the amount of lanes to a total of five instead of eight. Sustainability through efficiency is Drive Through Airport is the greenest airport concept. Besides making the airport more user-friendly for passengers and crews, all stakeholders benefit from the new concept. With a reduced footprint, airport operators have less capital- and operational costs. 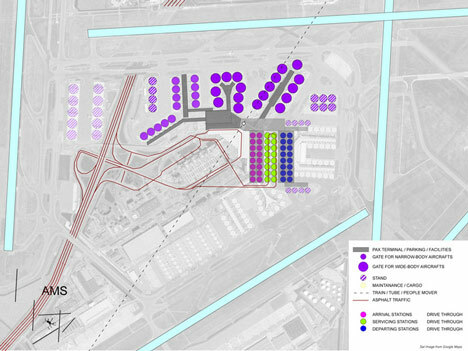 Additional space becomes available for other airport related revenues. Contrary to current terminals (e.g. Schiphol), where passengers are required to leave the mall area, in order to walk to their distant boarding gates, Drive Through Airport lets passengers depart directly from a mall. So passengers can do shopping immediately before boarding. Besides weather proof handling of the aircrafts, taxiing ways are also getting reduced. This saves fuel and increases the capacity for airlines. Transfer time for passengers and their luggage is also reduced, ultimately minimizing the number of passengers missing their connection. 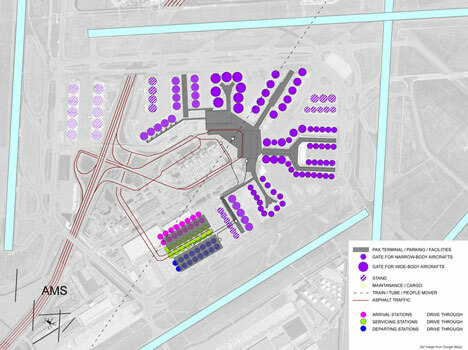 Airside tarmac and energy consuming building footprint is reduced to an ultimate minimum, while the capacity of the terminal is adjusted to the amount of runways. DDrive Through Airport is as green as an airport can be.